NETWORK UPDATE: There were no adjustments from the preliminary Friday numbers. CABLE HIGHLIGHTS: ESPN’s primetime Baylor vs. TCU COLLEGE FOOTBALL game owned Friday cable at 1.41. Discovery’s GOLD RUSH was steady, up 0.02 to 1.12, while PACIFIC WARRIORS declined 0.06 to 0.36. 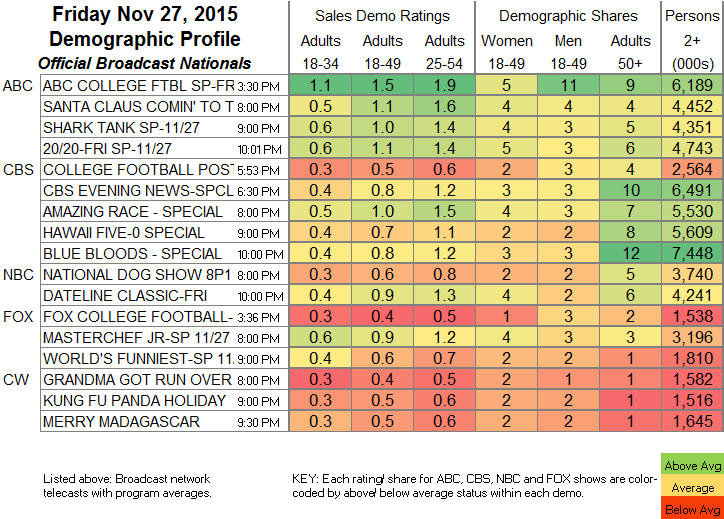 The night’s Hallmark movie CROWN FOR CHRISTMAS found a healthy holiday audience at 0.68. Swinging to the other end of the demo scale, Adult Swim’s BLACK JESUS was up 0.12 to 0.55 (in P50+, the Hallmark movie was at 3.03 and the cartoon was at 0.15). Syfy’s Z NATION gained 0.04 to 0.32. HGTV’s HOUSE HUNTERS INTERNATIONAL held at 0.32. 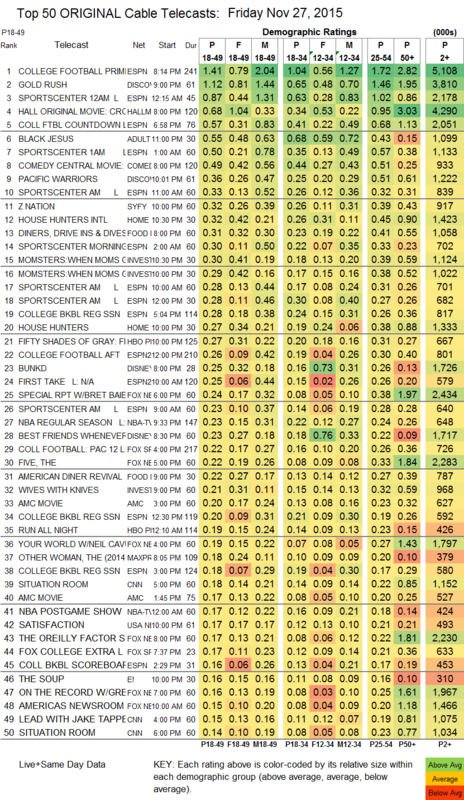 Food Network’s DINERS, DRIVE-INS AND DIVES was at 0.31. On USA, SATISFACTION slipped 0.03 to 0.17. A&E’s premiere of new episodes of UNFORGETTABLE was at 0.12/0.09. It was a good night for Cinemax’s THE KNICK, which jumped up 0.04 to 0.09, a solid number for that low-rated show. Someone will no doubt want the complete numbers for We’s marathon of its new series SOUTH OF HELL, some of which are on the chart and some not. In order of airing, they were: 0.05/0.04/0.03 (82K)/0.03 (89K)/0.02 (104K)/0.02 (117K)/0.02 (127K). Note that the fact that the 18-49 and total viewer numbers don’t line up may be a function of the tiny Nielsen sample as much as anything else.